Magic Hat decided it was a good move to sue West Sixth Brewery for trademark infringement, because they thought West Sixth's logo was too easily confused with Magic Hat's "#9" logo. Fair enough, let's take a look at two nice cans. Okay then. Magic Hat contends West Sixth Brewery's logo is an "inverted 9" — no joke, that's lifted straight from the lawsuit — and therefore infringement. 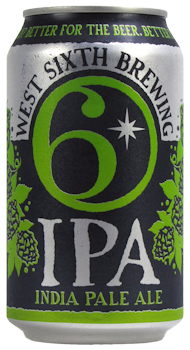 And West Sixth's compass rose is confusingly similar to Magic Hat's "dingbat" ... well, aside from the shape, position & meaning. Well played, Magic Hat. Your lawyers are magic asshats. It's not their first time. Are people confusing your apricot-flavored pale ale with a porter? Not likely. If so, something is wrong with the universe that your lawyers can't fix. Is "p" really an inverted "d"? Can both breweries please collaborate on a peace beer simply called "69"? Until then, sign West Sixth's petition. 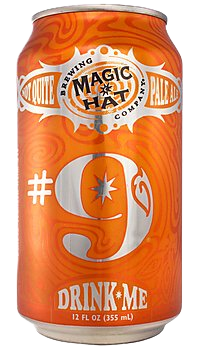 As "Dude" wrote on West Sixth's blog, Magic Hat #9 = EASIEST. BOYCOTT. EVER. Have an inverted-9-pack of something else. There are lots of other great beers out there, from breweries that don't sue everyone using numbers on cans. Magic Hat should concentrate on brewing good beer & let inverted nines remain sixes. Some irony for ya: Three years ago a trademark lawsuit was filed by Monster energy drinks (Hanson Beverage Co) against Rockart Brewery — a Vermont microbrewery — over Rockart's "Vermonster" beer. Rockart fought back with an internet publicity campaign. It turned into a PR nightmare for Monster Energy, & Monster dropped their demands. 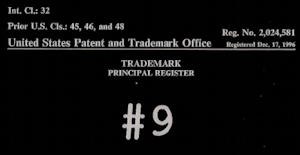 Because of the Rockart lawsuit, a study of small businesses bullied by large corporations was included in a 2010 trademark law passed by Congress. And now Magic Hat (started in Vermont — now part of a large corporation run out of Costa Rica) is suing a small brewery. This is a parody/complaint site about Magic Hat's brand bullying, not affiliated with Magic Hat Brewing. Anyone confused about that should stop smoking crack.